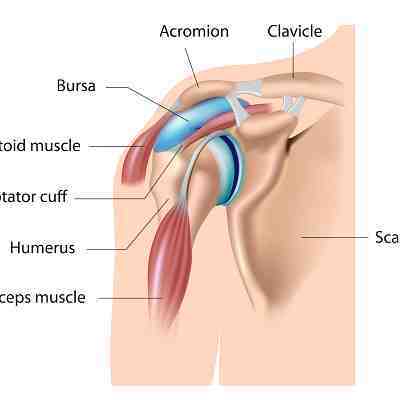 Bursitis - Symptoms and Treatments for Elbow, Knee Shoulder and Hip Bursitis. 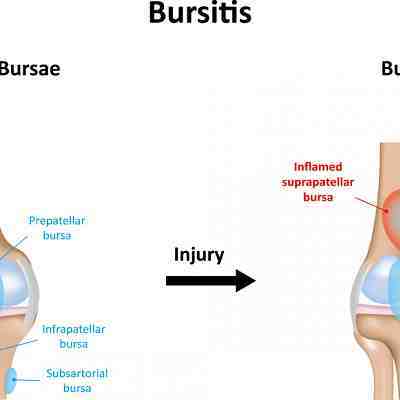 If you have bursitis, then what this essentially is is an inflammation of your bursa and as you probably already realise, bursitis will almost always cause pain! A bursa is a sac of synovial or lubricating fluid, positioned between bone, muscles tendons and skin. They are found around all over the body (over 150 of them in total!) where your tendons and muscles glide directly over bones. Their appearance is rather like a fluid filled cushion and basically that is their role - to function as a cushion-like barrier. The main ones that we see problems with are are located in the shoulders, elbows, hips and knees. Firstly, the pain will result from the tendon or muscle rubbing against the inflamed bursa. Then, continued irritation can lead to the tendon or muscle becoming inflamed and painful. This explains why we often see bursitis and tendonitis existing side by side. However, both bursitis and tendonitis can exist independently of each other. This section of the website provides articles on the symptoms and treatment of bursitis, along with a closer look at bursitis in the hips, shoulders, elbows and knees. The symptoms of bursitis always involve pain around the affected joint. It can be acute during exercise and can cause a burning dull ache after exercise. Night time aching is common and morning stiffness around the affected bursa is usual! Generally, rest and ice will be sufficient to reduce the inflammation, but if there is no noticeable progress then further investigation is required. Knee Bursitis is a common condition that usually occurs at the top of your knee. Caused by inflammation of a fluid-filled sacs (bursae), the symptoms include pain, swelling, tenderness and redness. Expert treatment advice from a Chartered Physiotherapist. Elbow bursitis is very common and very painful! Read on to find out more.